Treat your lips to this Lush treat! 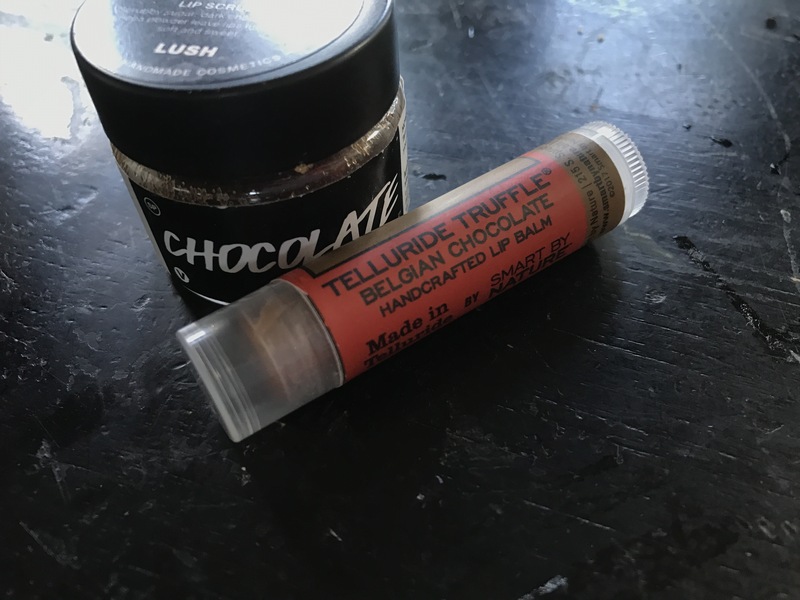 Lush chocolate lip scrub pictured with Telluride Truffle chapstick! Chocolate explosion. I love to follow with Burt’s bees mint chapstick for a refreshing chill, as well. So, recently I purchased a bunch of easter products from Lush for a friend. I’ve never jumped on the Lush train myself, so while ordering I decided to grab a chocolate lip scrub to try. I’m now obsessed with this product! If you are addicted to liquid lipsticks like me, you must invest in a great lip scrub. It just gets all the dried up, excess liquid lipstick off at the end of the day and repairs your lips to their rightful, youthful sheen. I always follow with a good chapstick though, because it can dry your lips out a bit. This product leaves your lips tasting great and feeling exfoliated and soft. Traces of tangerine oil underneath the chocolatey smell and taste make you feel like you just ate a tart! Just be sure not to scrub too hard, ouch! Lush Is a very natural brand and this particular product is made with sugar, cocoa, different natural oils, etc. Their service was great and my package arrived so quickly. I use this almost every night and always after liquid lipstick has dried out and caked onto my lips. This product is vegan and retails for $9.95. There are lots of other fun scents/flavors to try as well, like popcorn, bubblegum and mint julep! YES, Lush lip scrubs are soo good! I always have the Bubblegum scrub on hand!